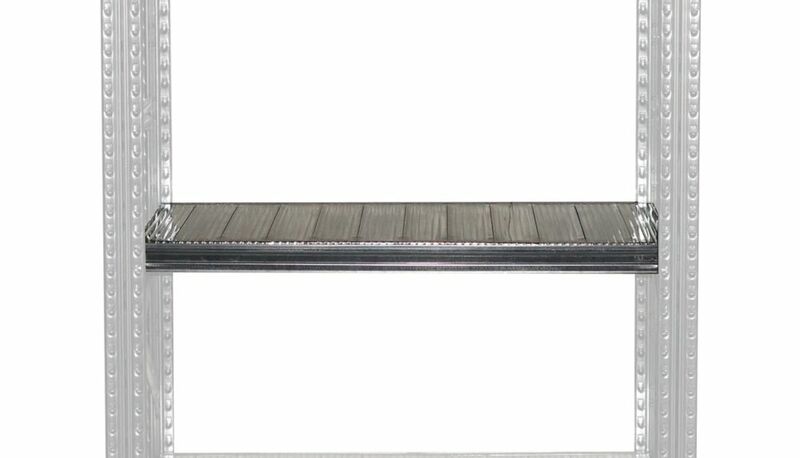 Edsal Heavy duty steel beam with two end connectors provides strength and easy assembly. Combine with welded end frames Edsal model s ER1772,ER1796,ER2472,ER2496,ER3072,ER3096 and wire or particleboard decking to create your own bulk storage unit. Durable industrial powder coated black finish. 2 Beams are needed to make one shelf. New rounded corner shelf with safety edges on all protruding sides. 22 gauge stainless steel type 304 no. 4 brushed finish welded to stainless steel wall plate. Perfect for commercial settings, janitorial usage, or restaurant usage. Metalsistem Complete Shelf 48 Inch Width x 16 Inch Depth, Safety Clips Are Included Metalsistems boltless system allows its user to simply and easily assemble the shelving unit without any special tools or know-how. Made from prime quality tensile steel, this unit is built to last, and holds up to 330lbs per shelf and 2,500 for the entire shelving unit. With a wide range of accessories and configurations you can build and create many different options for the space you have available.